During Transcranial Magnetic Stimulation (TMS) treatment, it is helpful to focus on self-care tactics such as healthy eating, mindfulness, regular exercise, and therapy that have been shown to enhance health and happiness. Depression can make it difficult to conduct self-care routines such as managing hygiene, eating, and exercising. Simply getting out of bed in the morning can feel unmanageable. Adopting healthy self-care practices helps to improve mental health and well-being during treatment. It is not necessary to completely overhaul one’s life; in fact, this can lead to guilt if goals are not met. Minor improvements in lifestyle are enough to elicit improvement, and should be a source of pride. Though it may feel “selfish” at first, we cannot be there for others if we do not take care of our needs first. There are many different self-care practices that can help improve physical and emotional health during treatment. The body and mind are intertwined; when our bodies are unhealthy, it affects our mental health as well. Not only does exercise lower our chances of heart attack, stroke, and diabetes, it also releases “feel good” endorphins that relieve stress and improve overall mental-well-being. Furthermore, scientists have found that exercise increases nerve cell growth in the hippocampus, a part of the brain associated with memory and learning. This brings about an improvement in mood, memory, and thinking skills, helping to relieve symptoms of depression. Improvements in memory and cognition are important, as depression can negatively affect our ability to think and remember clearly. Eating a diet rich in fruits, vegetables, and whole-grains helps to improve the health of the body and mind. Studies have found that people who reported eating a healthier diet were less likely to report being depressed. Attempting to eat three healthy meals a day is a positive step. Furthermore, it is important to stay hydrated and drink the recommended 8 8-ounce cups of water a day (half gallon). Another aspect of taking care of your body is sleeping well each night. Studies have found that limiting people’s sleep to 4.5 hours a night was associated with subjects feeling sad, angry, anxious, and mentally exhausted. Indeed, insomnia is associated with an increased risk of depression and anxiety. Adopting good sleep habits such as relaxing an hour before bedtime, going to sleep at the same time every night, and avoiding stimulants like caffeine and nicotine before bed can help to improve sleep quality. For some people, learning the practice of mindfulness can reduce anxiety and depressive thoughts. Mindfulness is a meditative practice where a person brings their attention to the present moment, noticing thoughts, emotions, bodily sensations, and the surrounding environment. Mindfulness meditation is non-judgmental; focused on simply noticing thoughts or feelings as they are, rather than passing judgment on oneself and thinking there are “right” or “wrong” ways to think or feel. Some studies have found that mindfulness based cognitive therapy can be as effective as antidepressant medications for some individuals battling depression. Mindfulness meditation has also been shown to help prevent the relapse of depression after improvements in mood have occurred. The practice of mindfulness meditation has been shown to shrink the size of the amygdala, an area of the brain associated with negative emotions such as fear, anxiety, and disgust. Furthermore, it increases the thickness of frontal cortical areas associated with higher order thinking such as planning, concentration, and decision-making. Depression is associated with abnormalities in the amygdala and frontal cortical areas, and TMS helps to normalize the brain activity in these regions. Practicing mindfulness during TMS treatment can improve the effectiveness of treatment by bringing about additional positive changes to the functioning of this part of the brain. It has never been easier to learn mindfulness meditation because there are many resources online such as guided meditations. While undergoing TMS therapy, some patients experience a greater appreciation for life. Gratitude is a mindset that includes counting your blessings and recognizing what you have such as shelter, food, or friendships. Gratitude also includes appreciation for the contributions others make in our lives. Depression can leave one stuck in a rut ruminating on negative aspects of life. Luckily, gratitude is a trait that can be practiced; like a muscle, this mindset can be strengthened with practice. Research has shown that simply writing down things that you are grateful for each day can make you happier, more likely to have goodwill towards other people, more optimistic about the future, more satisfied with life, and even more likely to have a good night’s sleep. It is a simple practice that can be adopted during TMS therapy. Lastly, it is important to make it to therapy appointments even though it can be tempting to skip them some days. A therapist is a very important resource for managing depression; they provide the necessary tools to help us keep improving and healing. By talking to a trained practitioner, we are able to develop a greater understanding of ourselves, untangle underlying triggers for depression and learn how to maximize health and happiness once depression starts to lift. 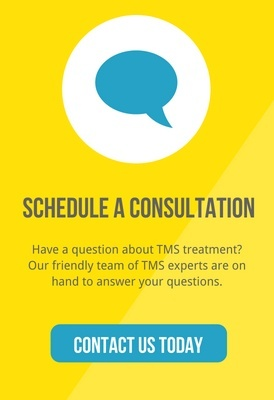 Similarly, if and when medications are needed, keep taking them to maximize the impact of TMS. While working to heal and take care of oneself, it is important to acknowledge and feel proud of all the small steps and not feel guilty for slipping up. Simply reaching out for help signals a readiness and willingness to heal. The road to recovery starts with small steps but self-care of emotional and physical needs will help ensure that you arrive at a place of health, happiness and wellness.